I’m totally swooning over this! And yes, I am definitely gung-ho about this “drunken” twist. It’s very much needed during the weeknights! Ha, ha! Thanks for stopping by, Chung-Ah – hope you give this one a try! Haha! Love it, Lisa! So glad you enjoyed…thanks for commenting! Now this is what I call a real noodle dish. I really love something that has a lot of meat and tomato in it. Reminds me of the awesome spaghetti that my grandma used to make but only in a different mix. Got to try it to tell the difference. This is an absolutely stunning dish, Ingrid; perfect for a weeknight meal. I think this is going on my menu for next week. Thank you! Hi Jennie – thank you! Glad to have you stop by! This looks Amazing! !! My son actually sent me the link for me to look at, because OF COURSE he wants me to cook it lol! Im off work later this week, so definitely giving it a try!!! THANKS! This looks like a big yum! I made this tonight cause my husband saw it and said it looked so good!! The only thing I did differently was I used chicken sausage instead of Italian sausage because the hubby doesn’t like Italian sausage…and can I just say that this is absolutely ahhmazzing!!! This is defiantely going into my recipe book, and will be a staple at my house!!! Thanks!!! Catrina, that’s great! I’m so happy that you and your hubby enjoyed this, and that it’ll go into your recipe rotation – thank you for coming back to share your experience with me! Where do I find those noodles at? Many grocery stores, Trader Joe’s, MARSHALLS, TJ Max, Amazon. I use Trader Joe’s Lemon Pepper Pappardelle Pasta. I used Amish noodles because we live in an area in the middle of nowhere and that’s what I like and is readily available. They turned out great. I made this for dinner tonight – DELICIOUS!! Thank you! Gail, that’s great – my pleasure! I love happy bellies, so thank you for sharing your feedback! I couldn’t find Pappardelle noodles. Never heard of them. So I bought Campanelle instead. Gonna start cooking soon. Well that’ll do just fine, Mary – please enjoy the recipe! Trader Joe’s sells two versions, a lemon and plain. I have made this with both types…and both are amazing. Love this Recipe, it is amazingly simple for how Great the flavor is…Awesome Recipe. Made this wonderful dish for my family tonight and it was absolutely OUTSTANDING!!!! Everyone cleaned their plates!! I did add about a half cup of halved cherubs with the bell peppers which I thought added a nice texture. Thank you so much for posting this recipe,it was extremely easy to follow and turned out excellent! I will definitely be back for more dinner ideas!!! Hi Katie! I’m so excited that the meal went over well, and that, apparently, you didn’t have to do any dishes afterwards, haha! 😉 Thank you for stopping by – I do hope you come on back and browse around for some more recipes to try out to share with your loved ones! Wow!! Made this tonight and it was AMAZING!! My husband and I loved all of the different flavors that came together so perfectly! This will definitely be put into the regular rotation of meals! Thanks! Kerri, thank you much! What a beautiful thing it is for a couple to have a tasty, home-cooked meal together; I’m so glad you both enjoyed the recipe, and I appreciate that you came back to share your experience with me! Boy, am I glad to hear that the recipe was worth driving in the snow & sleet for – whew! 😉 (Now that’s what you call devotion to good food!) Michele, thank you so much for giving the recipe a try – so happy both you and your husband enjoyed it! In an admitted “food rut”! Can’t wait to give this a try tonight. Being an adult student (38 and a Junior in College) and 5 kids at home, anything that is quick and tasty definitely gets my attention! Thank you for sharing! I have a question? If im not a wine drinker is there anything i can subsitute it with? Just use broth. I don’t care for the taste of wine in food either. This actually looks like goulash..which I love! Hi Sarah, great question! There’s really not a substitution I can suggest, but you can just leave the wine out without any worries; the pasta dish will still taste great. Enjoy! We absolutely LOVE this dishes. One of my husband’s favorites for sure. We substitute the wine with chicken broth and just use wide noodles. Thanks so much! I made this dish last week, and it was a hit. I loved it. My husband loved it. My friends loved it. It was so good, not to mention, so very easy to make. Thank you so much for the lovely recipe. Hey, that’s wonderful Jennie! So glad all of you enjoyed it – thanks for sharing that! This sounds SO good! I will definitely be trying it soon!! One question though, sadly my boyfriend is not a tomato fan. He’s fine with spaghetti sauce and ketchup and other “tomatoey” things, but chunks of tomatoes are a no go. (Yes I know, it’s strange, but I love him, so I deal with it. lol 😉 ) All that being said, any ideas on what to do without the tomatoes in it? Should I just use a little tomato juice so it still gets the needed moisture? I know it won’t be the same, but it was the first thought I had. I’m open to any suggestions! Hi Lynn, what a good girlfriend you are! 😉 Listen, you can just substitute tomato “sauce” (plain, in the same section/ store shelf) rather that the “diced” tomatoes; it is pureed, so he won’t have those chunks of tomatoes that he doesn’t like. Enjoy! Wow, not sure why I didn’t think of that myself, lol..
my son and I don’t care for chunks of tomato either. I used crushed tomatoes and it worked great! It still has some texture to it but really no pieces. I did need to add a pinch of sugar to the final sauce, but it was so delicious! I can’t wait to make it again. We really enjoyed this! We made ours with turkey sausage and it was absolutely delish. Next time will definitely make with pork sausage since we think that will be an even better choice. Can’t wait to enjoy again. That’s great Alice – thank you for stopping by to share! This dish looks delicious! I am going to make it next week. I loved your post about shaking things up too! This is my first time here and won’t be my last! Well thank you for stopping by the site, Marcia! Enjoy preparing this recipe! Hubby and I aren’t really into spices or sausage, could I used hamburger meat instead? Hi Melissa, ground beef would be a fine substitution. Enjoy! Do you mean white wine? This sounds really really good. Oops! I just noticed the boo-boo in the recipe; yes, I meant to say white wine. Thanks, Bev! That’s what happens when you cook with alcohol…ha-ha! I fixed this last night for dinner and LOVED it! Thanks for the awesome recipe! I made this tonight with homemade pasta – it was delicious! Thank you for coming back to share with me, Meghan! I found this recipe via Iowa Girl Eats and I’m glad I did. I made it for dinner tonight and it was delicious! 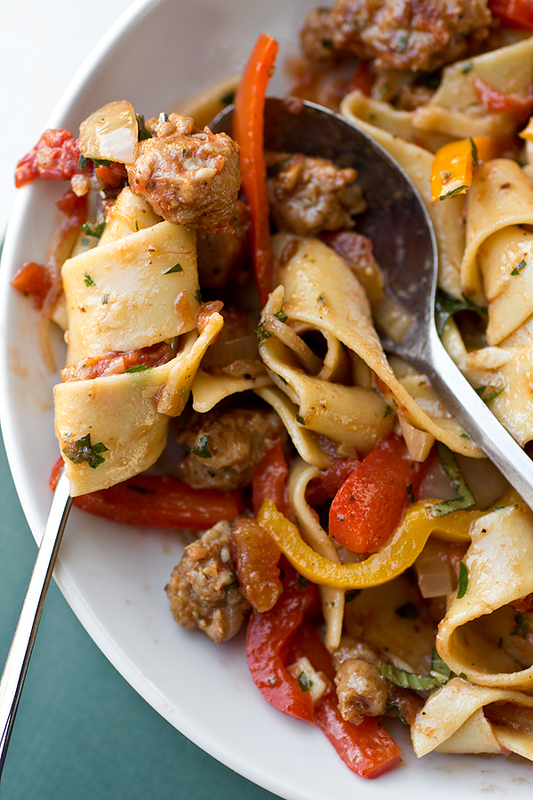 My first time trying Pappardelle noodles, yum – I used sweet Italian Turkey sausage instead of spicy, and it was still great! I’ve made this dish twice to rave reviews. One shortcut: Use ground Italian sausage. This is my first time to your blog, and I found this recipe on Pintrest. I just made it for dinner and it was amazing. Something about the flavor took me back to something that my Italian grandfather made when I was a little girl that I had long since forgotten. Sweet memory. Kathy, it’s a wonderful thing when a meal can bring back some cherished memories from childhood; thank you for coming back to comment and share your experience preparing this dish! Thanks for sharing! I just made this for dinner tonight and it was a hit with the entire family, including my sort of picky hubby. My two year old would have had a third helping, but daddy nixed that as he wanted some leftover to take for lunch tomorrow. I know I will be making this again soon. Aw, that’s precious Teresa! So glad that you and your family enjoyed this recipe – thanks for sharing that! This looks so amazing. Going out to shop for the ingredients so hubby and I can have a lovely meal together tonight. That’s just precious, Judy! And I hope that you and your hubby will enjoy this meal and your time together. Have a wonderful weekend! Sure Diane, that’s fine; or, you can just omit the wine altogether, without a worry. Enjoy! WHERE DO U FIND THE PAPPARDELLE NOODLES ? Hi Addie, they should be in the pasta noodle section of your market; but if they don’t have them, just go ahead and use a wide egg noodle pasta. I used fettuchini because I could not find pappardelle either. They are not usually in standard grocery stores like Publix etc. Fresh Market sells them. I just made this for dinner (with whole wheat spaghetti), and it was fantastic! Even my bell pepper-avoiding boyfriend ate every last red/yellow/orange strip! Thank you for the wonderful recipe. Becky, that’s great! The whole wheat spaghetti is a wonderful and healthy substitution, and I’m so happy this recipe turned out to be a tasty meal for both you and your boyfriend! Okay, this has to be the first time I have ever commented on a recipe before. Amazing. I made it just as it is, which almost never happens with me. LOL. I just could not think of something to change. I used my own home made fresh Italian Sausage. As for finding Pappardelle: Go to the fresh pasta section and purchase a tub of lasagna noodles and cut them into 1 inch strips. Then boil your homemade pappardelle about 5 minutes or so. It cooks much faster than dried pasta obviously. The texture and taste of the fresh pasta was amazing. I’ve never really used fresh pasta before and now I’m not sure I want to go back. It’s pricier, but hey, I never eat out. I find the pappardelle really makes the dish shine. I found your recipe from The Brown Eyed Bakers site on Friday and made this for dinner tonight. So good!! Made closer to 6-8 servings for us, but leftovers are great! Thanks so much, can’t wait to check out your other recipes! Glad to have you stop by the site, Stacy! Thank you for sharing how your din-din turned out, and I do hope you find some more recipes that you can enjoy with your family! This recipe is amazing! I just made it for dinner tonight and I can’t even begin to tell you how fantastic it is! I also couldn’t find the pappardelle noodles so I used wide egg noodles. They worked just fine. This will definitely be a regular meal in my house. Thank you! Hi Lisa, thank you for sharing your enjoyment of the recipe with me! Glad you were able to substitute some wide egg noodles for the pappardelle. I have never commented on anything from Pinterest but I had to tell you how amazing this was. My family loved it. Only thing I added was fresh chunks of a really good parmigiano cheese on top. Will make this ALOT! Thank you so much for your comments! And what a delicious addition the chunks of good, salty parmigiano are – I’m sure they took the flavors over the top! Thanks for stopping by. I wanted to tell you I came across your recipe on Pinterest. So I pinned it, it just looked so delicious. Well I received 61 pins and nine likes already! I can’t wait to make it! Have a great day! Mary, I truly think you will enjoy this tasty dish; very simple, but it has all of those complex flavors we all love in a good pasta dish. Thanks for sharing with me! How long does it tale to make? I need to know for a meal management project for my foods class. Hi Julie, once you’ve already cooked the pasta (that takes about 12 minutes or so) then preparing the dish is only about 12-15 minutes, I believe. Hope that helps! Yes it does, thanks. Can’t wait to make it! I made this tonight, husband isn’t into chunky tomatoes so used a 14.5 oz can of tomato sauce and used fettuccine noodles. He loved it will be lunch for him tomorrow too. Robin, that’s so great – hubby’s lunch! I’m thrilled you guys enjoyed the dish, and your substitution for tomato sauce was perfect; easy peasy, right? Thank you for the comments! OMG this was excellent! Thank you so very much for sharing. We made it for dinner tonight and it is taking all of my will power to not run to get seconds. I can’t wait to eat the left overs for lunch tomorrow. It’ll be perfect for lunch tomorrow, Carmen – it’ll taste even richer then! Thank you for commenting. I made this for dinner tonight, it was fantastic! My husband ate 3 servings. Thanks for posting, it was a great spin on plain ole’ spaghetti. We will be having the leftovers for lunch tomorrow. So happy to hear that both you and your hubby enjoyed this dish! Thanks for stopping by to share your comments and experience with the recipe! I looked through my kitchen and I have everything to make this for dinner tonight! Even the noodles! Yeay! Perfect! Don’t you just love when that happens?! Thanks for stopping by Tam. This recipe was perfection. I subtituted penne for the pappardelle but otherwise followed the directions to the letter. I’ve made many pasta dishes, but I must say this has to be one of the tastiest. Thank you for publishing this wonderful recipe. Well, that was absolutely delicious! Thank you so much for posting this recipe! Hi there! So I hit up my grocery store today and bought “almost” everything I need. I feel like a dork for asking but what’s “Italian seasoning”? Also, I don’t normally cook with wine so I was standing like a dummy in the liquor aisle and had no clue what I should buy. I forgot you said a Chardonnay and ended up buying a moscato white wine. Will that do? And will fettuccini noodles work? I also didn’t find the ones you list. Thanks a bunch!!! Hi Vero, “Italian Seasoning” is just a combination of Italian-type dry herbs such as rosemary, thyme, oregano and sage all in one bottle. You should be able to find it in the spice section of your store. And if fettucini noodles and moscato wine are what you have, then those will be just fine – no worries! The wine may be a bit sweet, but it should be OK. Have fun – hope you enjoy! Just so everyone knows, I found the noodles at Trader Joe’s. Made this tonight for supper and it was simply Delish! Can’t wait for my son-in-law to try it! How precious of you to want to share this with your son-in-law, Mary! So glad you enjoyed…thanks for taking a moment to comment! I’ve never commented on a recipe before, but I made this tonight & it was GREAT! Thank you! Hi Erin, I’m honored to have received your first comment on a recipe – thank you! So happy you enjoyed this enough to come back and share your experience with me! This is fantastic! I used some “spicy” chicken italian sausage, which was yummy although not that spicy! Next time, I’ll try to find something spicier (or do you think I could just add a little bit of red pepper flakes?) Still-extremely tasty and I can’t wait to have for lunch! Found this recipe on Pinterest and made it last month. It IS pretty delicious but I just gotta say with the layout on your page, it is incredibly difficult to follow the directions. It would be nice to have a breakup of the text. Thanks! Thank you for your comments, Sara. We’re always looking for ways to make the recipes as easy and clear for people to follow as possible, and do realize that perhaps a few more break-ups in the text would be helpful. Glad you enjoyed the recipe! Have you doubled this recipe before? Would it be double of everything or do you put less wine, tomatoes, etc? Going to make this tomorrow…excited! Hi Casey! I would just say to go ahead and double all of the ingredients so that you won’t be short on any flavors. The only things to keep in mind are that you’ll need a larger pot to prepare things in, and that the sautéing/browning, the steps, may take a little longer as there will be more ingredients to cook down or reduce. Otherwise, you should be OK doubling up. Please enjoy! Hello. Just wanted to say I made this last night and it was amazing! Thank you for a wonderful recipe. Casey, so glad you came back to let me know how the “doubling” turned out – thanks for that! So happy the recipe went well, and that it was enjoyed! 5stars for this one! A definite keeper. Amazing flavors that blend so well together. Only change was using egg noodles. Thanks for sharing. 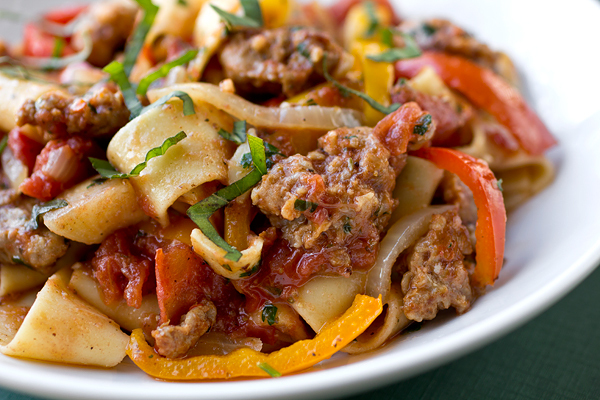 I made this last night with hot Italian Turkey Sausage and fettuccini (couldn’t find the others, even at Whole Foods!). Since my family like things “Thai hot” I added some red pepper flakes. Wow – delish! Best of all is the wonderful lingering aromas this morning in the house….I’m going to make this again! Thanks for posting it! Hi Julie! It’s funny some of the things that Whole Foods doesn’t have…if you have a Trader Joe’s near you, they have the pappardelle noodles & spicy Italian sausage, if you’re interested next time. I love that you added red pepper flakes, as I’m a huge fan of super spicy food, as well! So happy you gave this recipe a try! I came across this on Pinterest and made it today…IT IS DELICIOUS! I didn’t have any wine so just substituted chicken broth instead, and didn’t have any long noodles, so used bowtie pasta instead. Delish!!!!! I can’t wait to eat this again tomorrow then the noodles will soak up all of that yummy sauce! Hello there! I stumbled across this recipe on Pinterest and we made it today for Sunday lunch. It was perfect! So yummy. we are keeping it in our recipe file. A couple of things I did different: I didn’t have a 28 oz can of diced tomatoes so I used 1 14 oz can I had on hand and a can of tomato sauce. I used White cooking wine. And I couldn’t find the type of pasta you used so we used bow tie pasta. SOOOO GOOD!!! thank you for sharing. Rachelle, congrats on making your pasta from scratch – I’m totally impressed! 😉 I’m so happy that the recipe turned out great for you, and your substitutions were delicious, I’m sure. Thanks for coming back to share your experience with me! I made this last night for dinner and we LOVED it! My husband and I were crazy about this dish. This is my favorite Pinterest dish I have made. It was so flavorful and tasty. I will make this again and again. I am sharing with all my family members too. THANK YOU! That is so awesome, Lesley! I’m thrilled that the recipe was a hit, and that you feel it’s worth sharing – that’s the best kind of compliment I could get. Glad you and your hubby enjoyed! Amy – you can deglaze with chicken broth instead of wine, too. I love the name of this recipe – been making this for a long time, but now I have a great name for it! Thanks! Oh, and Trader Joe’s has great pappardelle in 8 oz pkgs (with the dry pastas). Wow, this must be good by the looks of all the traffic. This needs to go on the menu. I ate something similar to this at California Pizza Kitchen years ago (no longer on the menu). I began making it at home and it has become one of my “go to” recipes since it is so quick and easy. The only real difference is that I use a red onion and instead of seasoning, wine, tomatoes, I use a jar of spaghetti sauce. I usually use penne-but I think your presentation with the noodles looks fancier! I also think that using the tomatoes will make it lighter (I use the petite diced-eliminates that “large chunks of tomato” problem). Can’t wait to try your version. Excellent, Debi – hope you enjoy this version! Spicy, but not overbrearing with a wonderful aftertaste of flavor. We’ll be serving this for company and I know they’ll love it as much as we did. Thanks for the recipe. Hi Vin, thanks so much for your comments! So glad you you enjoyed the recipe well enough to serve to guests; what a nice compliment. Thanks for coming back to share with me! Lindsay, let me just say that I love that term, “dinspiration”! Thanks so much for taking some time to share how things turned out for you – the substitutions sound perfect, and I’m thrilled that you enjoyed this particularly cozy pasta dish on such a chilly evening; perfect! I had to comment on this dish. I have made it three times and every time I’ve made it everyone has loved it. I saw this on pinterest and and what a success. Thank you, thank you! Thank you so much for that, Susan! So glad you’ve enjoyed this! Made this for dinner tonight. Lots of chopping, but well worth it. Good flavors. Found the noodles at an Italian market and bought the spinach variety. Made a very colorful dish. This is a keeper. I made this tonight and my family loved it. This is a keeper. My oldest son said to make plenty next time. This looks and sounds like the kind of food I like to eat. One thing, though, my husband doesn’t like sausage. Wondering if I could use lean ground beef instead, and also, what could I use instead of wine? Hi Joan! Yes, by all means use the ground beef – it’ll be delicious; and as far as a substitute for the wine, you can use chicken stock for a little kick of flavor. Enjoy! Hi Jeanene, you can sub ground beef or turkey/chicken sausage, instead. WOW! Amazing recipe, can’t wait to make it again. I’m glad I went out of my way to track down these noodles, they are so worth it. And I was a little nervous about the oil added in at the end, I thought the saucy might end up kind of “oily” but I’m glad I went ahead and followed the recipe. Love it! Excellent, Ayla! So glad you enjoyed! Made this last night, it was fantastic and will be a regular on our menu. Some recipes I’ve tried with simple ingredients lack flavor, but not this one. Thank you for the recipe! Made this with sweet rather than spicy Italian sausage. Liked it,but can see where the spicy would probably have been better. Hard to find the pasta, but I did, at an Italian market. Will definitely make again. I just wanted to say that these are SO GOOD. I had plenty left over and am having a hard time staying away from them!! Thank you! Made this for dinner a couple of nights ago and it was delicious! Unlike me, my family aren’t huge pasta fans. I could tell they weren’t happy when I placed it on the table, but after one taste, they said it needed to stay on the menu. Thanks! Awesome! Made this tonight and we all loved it. Could not find the noodles here in Great Falls, Montana so I used fresh fettuccine noodles. Again, yummy! Hi Marie! Very easy fix: just go ahead and let the sauce reduce a little longer next time. You do want the juice from the canned tomatoes, it’s just an issue of allowing more evaporation to take place. (Perhaps my flame was set to a “higher” heat level than yours, so mine reduced quicker.) But here’s where you can just use your own discretion and allow it to reduce longer, until it’s less “watery” and a bit more saucy. Hope that helps! That’s what I figured, thank you so much ! 🙂 I will return after I try It again!! Made this tonight for the hubby, we loved it!! I even made it extra special by making my own pasta! Oh my, this looks so incredible! Love the cultural fusion – I always order Drunken Noodles at Thai restaurants, and LOVE the idea of an Italian version. “And as always, with food there are no rules, in my humble opinion—only one requirement: that it tastes good.” Amen! I also stumbled across this recipe on pinterest. Wow! One of my favorite finds to date! I will definitely be making this again soon! P.S. The wine paired very nicely! Good call. Thank you for a delicious recipe! My local grocery store didn’t have papperdelle noodles so I subbed in fettuccine noodles instead. I will definitely make this again! Krisellen, thank you so very much for sharing your thoughts with me; I always very deeply appreciate when a reader shares that something in the post touched them, or “resonated” with them, as you said. I think we all have a lot more in common on the “inside” than we’re actually aware of, and if we can find a way to share ourselves, then we can connect to one another more deeply. Please enjoy the recipe! It was my pleasure, Tania! Perfect to pair with a nice, simple salad. Glad you enjoyed! Made this beautiful dish last night with my hubby. He cut all of the veggies while I sautéed the sausage and got the water boiling for the noodles. This was by far the tastiest and easiest dishes I have ever made!!!! We both absolutely LOOOOVED IT!!!! My husband is a Chardonnay lover, while I am a Cabernet lover, so I did use the Chard in the recipe, but enjoyed the meal even more with a glass of Red! I love how relatively simple the ingredients are, but the flavors explode in your mouth! WOW! You are my new BFF! Thank you for sharing this fantastic recipe! This is one of my favorite recipes! I’ve made it several times and I’m making it again tonight. Thanks for a great recipe. Made this and my family loved it, even my pickiest eater my 9 year old. This is by far our favorite new recipe. The flavors just meld together so well. We will definetly make it often. Thank goodness for Pinterest! I made this tonight and it is outstanding! Only substitution was spicy turkey sausage. This is a dish that will be even better tomorrow after all of the flavors soak overnight. 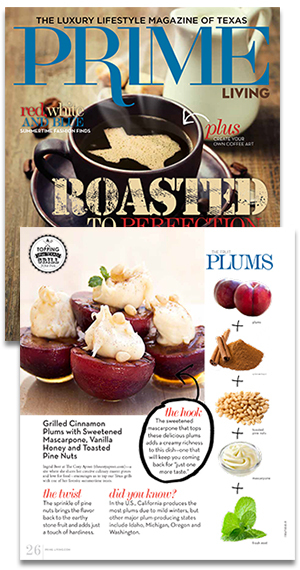 Love the message, love the recipe…can’t wait to see what else is here. Hi Tia! You’re absolutely right that the flavors will soak up all the goodness and be super delectable tomorrow – enjoy it then, too! And thank you for your kind words and for sharing your experience; I do hope that you peruse around and fine some more recipes that interest you, and that you will enjoy preparing and eating! OMG I love this!! drunken noodles? Where do I sign up? I found this recipe on pinterest last week. I made it for dinner, and it is amazing. I loved the lightness of it. I had not cooked with pappardelle noodles before, but I had wondered if they would have that “thai” texture as my son loves thai food. I will definitely be making this one again. I will be blogging about it this week. My husband only is on pinterest in hopes that i will make something he pins. He is looking forward to this dish tonight. I also had trouble finding the right noodles, although i have found them in the past. I chose an alternative wider noodle. Looks really good. Hi Barb, hope the two of you enjoy this dish tonight! Thanks for stopping by to share with me. It was delicious, we used red wine because we had some open and were liberal with the basil. Next time I might add a pound of Manila clams. Thanks for sharing your experience with me Colin! I’m sure that the Manila clams would be an extra-special addition to this pasta dish – great idea! Hubby started this before I got home and pretty much finished it besides the last touches. It was amazing even though he misread :p and added Spicy Italian dressing vs Italian seasoning. It still ended up fabulous! I made this tonight, it was so good! Great recipe! Wonderful, Tamere – thanks for sharing! Wow! I made this on Sunday, and it was fantastic! My husband was an excellent cook, and since his sudden passing, I have been eating nothing but processed food. I saw this recipe, and decided it was time to start cooking, in honor of my husband, and I could not have started with a better dish! Ingrid, thank you so much!! Anya Rose, I hardly have the words to tell you what your comment meant to me. First, please allow me to extend my deepest condolences to you over the passing of your husband; I am truly sorry for your loss, and can only imagine what you have gone through and are going through every day as you put one foot in front of the other and continue on. You’ve blessed me with what you’ve shared, and have filled my heart with a renewed sense of why my husband and I work on this blog together. The idea that one of my recipes could in some way be a part of a healing process is amazing to me; and that you would come back and share what you did with me, is a gift. Thank you. There seems to be a sense of joy in your comment, and sense of optimism for embarking on an endeavor that your husband enjoyed so much himself, and I’m honored that you chose a recipe of mine to begin your own process of cooking in order to honor your beloved husband, and honor yourself. May God bless and comfort you, Anya Rose! Please come back and keep me posted on your journey! 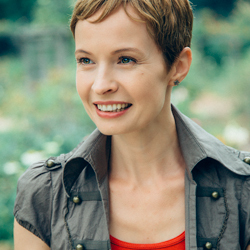 Thank you so much Ingrid for your truly beautiful response and heartfelt condolences! Chris was an amazing cook, and showed his love of family and friends with his delicious meals and entertaining ways! I miss him very much. He joked that when he was traveling I would starve, as he was not there to cook for me…so when he passed, I promised myself to start cooking so he would not worry. It’s taken awhile but here I am! I will be making many more of your dishes from now on! Your blog is so warm and inviting, it does give me joy and comfort. Thanks again! Wonderful, Anya Rose! So glad to hear you’ll be trying out more recipes. And please don’t hesitate to comment or email if you have any questions about the recipe, or just want to keep in touch! My heart is so happy that you are embarking on this cozy and good-for-you hobby; and I thank you for acknowledging how you feel about our blog – it means so very much to both my husband and I! Catherine, dont’ they say “better late than never”? 🙂 So glad you you did, in fact, get around to making this recipe; and I’m so honored that your boyfriend gave it the “best pasta dish ever” award! I will cherish that! Thank you for sharing this with your friends and family, and thank you for taking some time to come back and comment! Made this for dinner tonight and it was fabulous! Thanks for an awesome recipe! It was my pleasure, Chelsea! What are Pappardelle Noodles? In the photo they look like egg noodles. I can’t find those noodles in any of our local markets, so would egg noodles be good substitute? Hi Toni! The pappardelle are egg noodles, just wider, more “ribbon”-like ones. Yes, substitute any noodles that are as close to these as possible, and you’ll be fine. This meal was amazing! So good, it tasted like someone else cooked it for my family. Thank you so much. I can’t wait to make it for others, so they can enjoy it also. That’s funny, Carrie! And I’m glad you’re wanting to share this with others; isn’t that a huge part of the fun of cooking? Thanks for stopping by! This was such a huge hit the first time I made it, that tonight is the encore performance requested by my kids. I love that it’s such a quick fix! Found this on pinterest. Printed and copied for practically everyone I know. 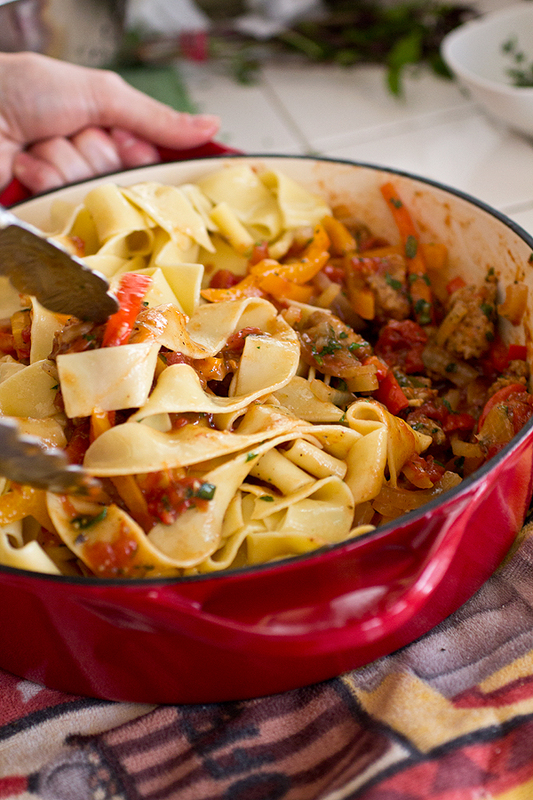 Delicious pasta dish….everyone in my house loved it! I tried this the other day with some seasoned ground lamb and red wine and it was fantastic. I don’t really measure things, sort of just go with what I have and it turned out so good. I can see all sorts of possibilities with this. Thanks! Excellent, Zainab! Thank you for sharing! I made this a couple of weeks ago and brought some to my neighbors to enjoy. The called me up and asked me what restaurant I bought it from… It was so so good! Thank you for the incredible recipe that my family will forever love! Made this and it was great! Didn’t change a thing, perfect as-is. Thanks for sharing! I made this once and I thought I had died and gone to heaven. This was delicious! Now I make it at least once a week! Thank you! Aw, that’s precious Charlotte! Thanks so much for that – I’m so happy that you’re getting good “mileage” out of this one! Hi Amanda, I always love reading that someone not enjoyed the taste of the recipe, but that they had a great time preparing it, too! Thanks for stopping by to share that you and your family enjoyed this dish. Me and my kids love this dish. It has become a favourite. I made this dish last night and it was AWESOME! I couldn’t find the pappardelle pasta so I subbed Fettacini instead and it was fine. Didn’t think my husband would like it much because he’s not into pasta much, but he surprised me! He Loved It! Thank you for a great recipe! Hi Patricia, husbands have a way of surprising us wives from time to time, don’t they? 🙂 So happy that both of you enjoyed this pasta recipe, and thank you for coming back to share that with me! And 1/2 cup of wine makes these “drunken”, hmmm, would have definitely gone wild and out of the comfort zone and added at least a cup, then another cup of red just for the heck of it! And I’m so glad to read your treatise on how to live, it sounds like a fabulous idea and how great it comes from a chef of all places…let’s hope all of us can move on and up and into the next comfort zone with all this delicious food you expose us to. This recipe sounds absolutely wonderful and I am getting the “stuff” together tonight to make it and yes am going off the board and adding more wine, so there!!!!!! I’ve had this on my “recipes to try” Pinterest page for ages and finally made it tonight. YUM! It was so easy to make and really delicious. My fiancé and I look forward to having the leftovers for dinner tomorrow night. It is definitely being moved to my “recipes I love” Pinterest page for future use. Thanks again!! That’s great Jessica—and thank you for moving this recipe to your “recipes I love” Pinterest page! I love it! I’m so happy that you & your fiancé enjoyed this, and that you both even have some leftovers for your dinners tomorrow! Thank you for your comments. I decided to throw a little spicy, drunken noodles into our Valentine’s dinner to rave results. It is on our make-again list. Thank you. Hi Kelly, what a perfect choice for a “spicy” and romantic holiday! So happy you enjoyed the recipe, and I thank you for taking a bit of time to come back and share with me your results! I have made this time and time again and it is a hit every time! Thank you for a great go to recipe! Made this tonight and LOVED IT! Made 1 change and that was to use chicken broth instead of the wine. Very tasty! Great substitution, Linda—and I’m glad you enjoyed it! Made this for dinner tonight after finding it while browsing food pics on Pinterest. SO D**N GOOD!! We really really loved it. I’m putting this one in my “Favorite recipes” book after just making it ones, that doesn’t happen often!! I substituted white wine for red, cause that was what I had, but I imagine it would work well with white too! What a wonderfully enthusiastic comment, Emma! I love it! I’m thrilled that you found this on Pinterest and not only enjoyed eating this, but preparing it, as well. And I’m honored that this little recipe will have a place in your “faves”, too! Thanks so much for coming all the way from Sweden 🙂 to share your experience with me. This was awesome! I would add more garlic but the flavor is great! Lisa, I’m ALL for adding more garlic—the more the better! So glad you enjoyed! This was soooo good! I made this last night and my wife loved it. Its a keeper. I had to buy the Pappardelle noodles at an Italian store/deli. Everything just went well together. I will make this again, and soon. Hi Chuck! That is absolutely wonderful that you prepared this for yourself and your wife. And the fact that you actually went to an Italian deli/store for the pappardelle shows that you must be a fan of cooking, not to mention a fan of good food. I’m so happy that you both enjoyed this pasta dish, and I truly appreciate that you would come back to share with me your experience! Sue, you are a hoot! 🙂 And I certainly hope that you, indeed, basked in a dinner well done, and enjoyed that leftover wine! I love to read comments that describe that even the “picky” people in the family enjoyed a particular recipe; it makes me feel happy for the one preparing the dish, that everyone leaves the dinner table fulfilled and happy! Thanks so much for stopping by to share! I made this several months ago for a get-together with friends, and it was a hit! Only changes I made were to use turkey Italian sausage, and whole wheat egg noodles. I also added some sauted mushrooms that I had on hand. I’ll be going back to this recipe again tomorrow for a family Sunday dinner. Can’t wait to have this again! Heather, that sounds delicious! Thanks so much for sharing that you’re enjoying this recipe—hope your Sunday family dinner will be a success! Wow. We made this tonight and it was delicious! Even my son – who hates veggies – ate it and ate the veggies too. I pinned and shared on FB. It is that good! Hi Kelly! Glad you enjoyed this pasta recipe, and I love when the little ones eat their veggies! Thanks so much for stopping by, and for sharing this recipes with friends and family—always appreciate that! I found this recipe on Pinterest, and there are recipes I really like, but rarely do I go make a comment on the original poster/blogers site… but OH MY GOSH!!!! this is hands down one of the best meals I’ve ever made. So delicious and full of flavor! I didn’t make a single adjustment. This is the BEST meal I have EVER made on Pinterest, and I basically make Pinterest meals every single day! (do you mind if I review this on my blog? I will not re-type the recipe on my blog, but direct them to your blog to give you full credit?) its sooo good! Made this last night, and my family loved it. We will definitely make again. Thanks for sharing!! Thank you, Candice! Glad you all enjoyed! It’s what’s for dinner tonight. Looking forward to this one. Thanks for sharing the recipe. I just made this for dinner. 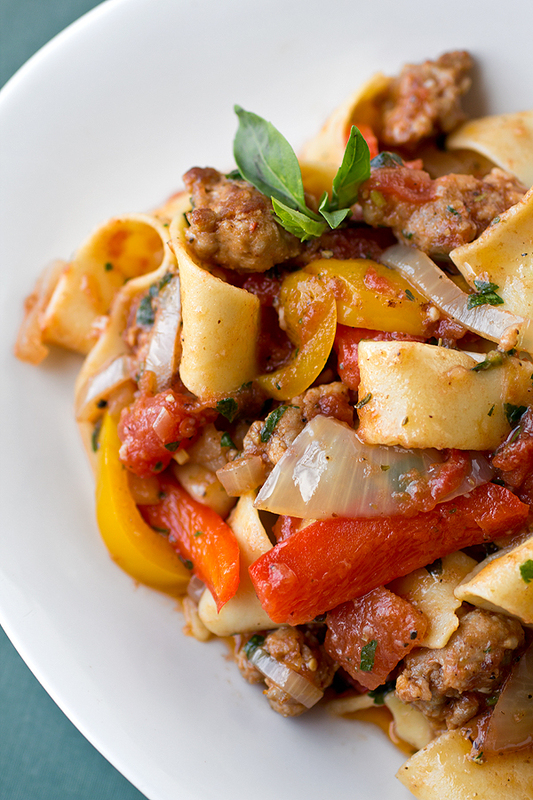 I used extra spicy Italian sausage and added artichoke hearts with the bell peppers. Amazing! I could eat this every night. Sarah, the addition of those artichoke hearts sound delicious! Glad you enjoyed the recipe, and thanks for stopping by to share your experience! Made this a couple of weeks ago and everyone loved it and asked that I make it again. So this is what is for dinner tonight. Hi DJ! Glad you’re enjoying this recipe! Thanks, Ryan! So glad you enjoyed! Trish, that is so very kind of you to say! I was truly very touched by your comments, and I so thrilled that my recipe has been a part of your meals this rainy month, multiple times—it makes me happy when people get some joy and comfort out of one of my recipes! Thank you for sharing with me, and here’s to more uplifting weather for you all, soon! I made this last night and everyone LOVED it and went back for seconds! It didn’t take long to make but I prepped and cut all the veggies the day before. Only thing I did not add was the parsley because I forgot to get it at the store but it was really fine without it. This recipe is definately a KEEPER! Hey Jenny! That’s wonderful—and a great way to help yourself out with time by prepping the day before! I’m honored that this dish was enjoyed by all, and I thank you for your comments! Oh my gosh!!!! this was a huge hit at my house! My husband said it was dinner and dessert all in one! Great recipe! Wow, Christie—dinner AND dessert?! 🙂 How happy am I that you guys both enjoyed this! And thank you for sharing your experience with me. Made it, Have to say this became one of my favorite dishes! We were looking for something different and something that wouldn’t break the bank to make. I had some of the ingredients right in my cupboard, the stuff I had to buy was around $20. So our entire family ate for $4.00 a piece. The recipe was amazing and we will definitely be eating it again. My kids even had seconds! One question though, do you know about how many calories per serving? Thanks. omg! found this on pintrest and I made it a few months ago, but wanted to thank you for sharing this. It was SO delicious!!! Such a nice twist to pasta! Omg! Not only was this delicious but the aroma was so awesome in my home. Hmmmmm!!! I didnt have a chardonnay handy so i used a mascato for mine. Idk if that changed the aroma will try chardonnay next time. Sylvia, isn’t it so wonderful when the aroma of a good meal permeates throughout the home? Thanks for sharing your comments with me! Made this today and it was FANTASTIC! My guys said it was a massive WIN. I used ground Italian mild sausage and added zucchini and yellow squash and used my own homemade tomato sauce instead of diced tomatoes. We all loved the explosion of flavors! Thank you!! Glad to hear it—nice additions/tweaks, too! I’ve made this dish twice so far and it was absolutely delicious both times! It’s such a quick and easy recipe that it has become a staple in our household! Thanks for the awesome recipe!!! I made this last night and it was so good. I am not a huge spicy fan so I used sweet italian sausage. I knew with all the wonderful reviews this had to be good and I was not dissapointed. Thanks for the great new recipe and for leftovers for lunch today!! In a word: PERFECTION!! My family loved it! Found your recipe on Pinterest a couple of days ago…and hubby says it’s the BEST recipe I’ve pinned thus far. He’s helping himself to seconds at this very minute. Even our teen daughter (who likes her pasta with butter/salt/parm only) said it was delicious. She cleaned her plate. Thank you for a dish that’s simple to prepare, bursting with flavor, and a real crowd pleaser. Hi Suzy, what a wonderful comment, on every level! Thrilled that both your hubby and daughter enjoyed this pasta recipe, and that you had the opportunity to stand back and enjoy the results of your labor! Thank you for taking a moment to share with me. This is beautifully written and sounds truly delicious!! I am adding this one to my cache of recipes to do… I think I will add mushrooms to the mix. Yum! Thanks so much, Genevieve! Hope you enjoy this (with mushrooms) 😉 ! Renee, while it IS sad when there a no leftovers from a good meal, it only means that it’s worth making again, right? 🙂 Thanks so much for sharing; and what a great way to make this dish your own! Just made this dish and my whole family loved it. It was flavorful and simple to make. Thanks for the recipe! Thanks for sharing that, Renee! Glad you all enjoyed! I love this pasta!! I make it all the time now!! Thank you for this recipe!! This recipe looks wonderful. Definitely going to make it this weekend. However, I’m not a fan of canned tomatoes. Do you think fresh tomatoes will be an alright substitute? Hi Rebecca, you can certainly use fresh tomatoes; it may not be quite as “rich” or concentrated (since canned tomato products are a bit more concentrated), but you would still get that tomato-y flavor. What I typically do when I make a sauce from fresh tomatoes is use some tomato paste—maybe 2-3 tablespoons—just before adding in the fresh tomatoes; that will definitely bump up the richness. Hope you enjoy! I made this recipe last week – it was easy to follow and well written…. But, it was very bland. I had to doctor it up quite a bit. The sauce is cooking on the stove as I write this. Followed the directions and it made a lot. ( that’s a good thing ) Can’t stop sampling the sauce ! 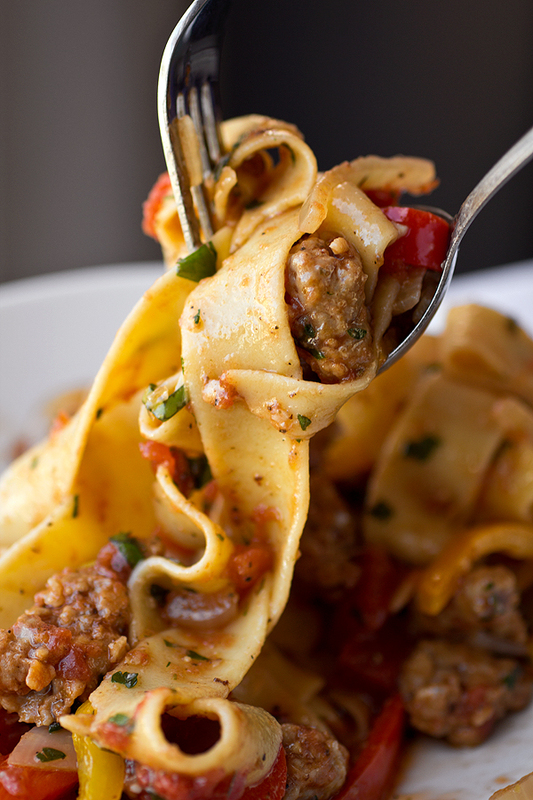 We love pappardelle it’s one of our fav’s . My husband thinks we’re having chili tonight but he will love this . Your recipes are great and thanks for posting them on Pinterest . I’m a fan . Katherine, I’m actually so excited for you! 😉 (And hopefully, your hubs won’t be disappointed that he’s not having chili!) Please enjoy, and thank you for sharing a part of your cooking process with me. I can’t even tell you the number of times I have made this recipe. My entire family loves it and demand it frequently! Thank you for sharing! I am excited to make this tonight but have a question about the spicy sausage. My store had “mild” or “hot” so I am guessing hot is the way to go? I don’t usually buy it so am not that familiar with how spicy or hot it will be. Hi Ashley, if you’re not that familiar with spicy food, then I’d recommend you go with the “mild” version, just to make sure it isn’t too much for you. Hope you enjoy! I made this tonight for dinner and it was wonderful. My husband said it tasted like restaurant food which I thought was a great comment, especially since I’m a fairly inexperienced cook. Thanks for the recipe! Hi Terese, bravo!! 🙂 That’s really great! So glad you and your hubby enjoyed this, and I hope you continue to have fun in the kitchen! Hi Mila, that’s perfect! Glad your hubby enjoyed this, and I think it’s wonderful that you’re willing to share this with your friend, as well! Thanks for your comments. i have made this twice now and it is delicious! My family loves it!!! Angie, I’m thrilled to read that—that’s great! Thanks for sharing, and I hope you and your family continue to enjoy this dish! I found this on Pinterest a while ago but finally made it tonight. I cannot believe I waited so long. It is delicious!!! Thanks, Janice! I appreciate that. Hi this recipe is so up my alley! I can’t wait to make it this week. I have 2 questions though. 1 is I hate sausage, can I use ground beef instead? Also since my mom simply can’t read and doesn’t pay attention 2 my specific shopping list, I got curly parsley instead of flat so can just chop it up. Can I use curly? Hi Jamie, certainly use what you like, and what you’ve got! The ground beef is perfectly fine, and just chop up that curly parsley very finely; it won’t have a very strong flavor, but it’ll do. Hope you enjoy! Just finished devouring this. Made to specs except couldn’t find papardelle so substituted with tagliatelle…delicious! Yay! So glad you enjoyed this, and thank you for your comments! I was wondering what white to use. do you use white wine that you can drink? Hi Michelle! Yes; definitely use a white wine that you would drink, though it certainly doesn’t have to be expensive. (And since it’ll already be open, why not enjoy it with dinner?) 🙂 Hope you enjoy. I made this the first time I cooked for my boyfriend and we both absolutely loved it! We’re making it again tonight for Valentine’s Day 🙂 thanks for the wonderful recipe! Mary, thank you for sharing that; and may you and your boyfriend have a lovely Valentine’s Day! Glad you’re enjoying this recipe! I just made this dish as a Valentine’s dinner for my family as we got hit with a snow storm, and our dinner reservations were cancelled. I was scrambling for something different to make that would keep everyone happy. This dish was absolutely delicious! My family loved it! Also, I had never used Pappardelle noodles before, so it was a nice change. Thanks for posting such a great pasta dish. I’ll definitely add this as part of our regular menu going forward. Dana, I’m so tickled that you prepared this for Valentine’s Dinner! So sorry your reservations were cancelled (you poor folks! ), but this seemed to have brought the family together beautifully. I guess it was meant to be! So thrilled you all enjoyed, and thanks so much for sharing with me! Finally got around to making this tonight, after pinning it months ago. Fantastic. Wonderful blend of flavors and textures. Wouldn’t change a thing. Well done! Hi Libby, thanks so much! So glad you enjoyed! Out of the hundreds of Pinterest recipes I’ve foisted on my family, this is by far our favorite. It’s in permanent rotation! Thanks so much. I’ve made this twice. A family favourite! Wonderful, Colette! Thanks for sharing! Hi Michelle, you should totally double up on the sausage if you’re fans! So glad you all enjoyed it; and thank you for taking a moment to share your experience with me! I have made this several times and the family really likes it a lot. Gonna make it again this weekend. Thanks for the recipt! DJ, so glad to read that! It’s my pleasure, and I hope you all continue to enjoy it! Holy cow. This is one of the best pasta dishes I’ve ever had. Thank you so much! Hey KP, glad you enjoyed! Thanks for your comments. I made this for dinner tonight and it was delicious! I prepared 16 oz. of Pappardelle instead of just 8, and I found the portions perfect. Do you have any nutritional information? Anne, so glad you enjoyed! 🙂 I don’t have the nutritional info, but here’s a site that may be able to help you in that regard: http://www.caloriecount.com Thank you for your comments! I made this dish for tonight’s dinner and my family loved it, the only thing a changed was the noodles, couldn’t find the pappardelle noodles so I used fettuccine, but I am going to find the right ones so I could make this wonderful dish again. Thanks you very much for sharing it with us. I particularly love it! Ellie, it’s my pleasure! And thank you for coming back to share your comments with me; I appreciate it. Your substitution of noodles was perfect; and yes, if you happen to find the pappardelle, they’re nice because they have a sort of “silkiness” to them. Really happy that you enjoyed the dish! I follow your advice on making it with the pappardelle noodles and it was so delicious even better than the first time I made it with the fettuccine, it gave a silk taste, thanks so much for sharing it with all of us. I will continue making this dish for my family and friends the rest of my life ….hahaha I know it sounds a little dramatic but is so true. Thank you very much! Ellie, that’s so touching! So glad you’re enjoying this dish so much, and I thank you for sharing that with me! This is on the menu for my son’s birthday party this weekend. Yum thank you. Hi Jeanne, hope you enjoy! 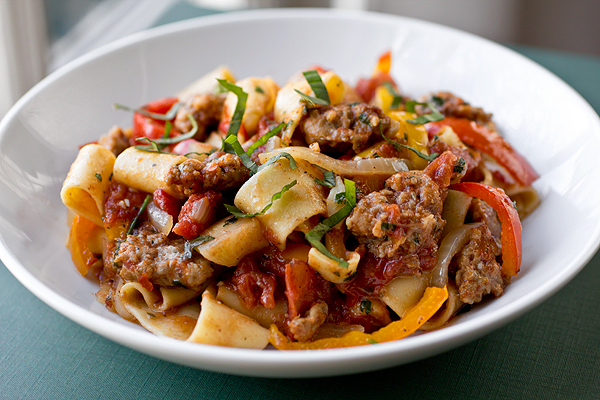 This is the best “simple” pasta dish with italian sausage I have tried. It is superb! Julie, that’s wonderful! Thanks so much, and I’m glad you enjoyed! I’ve decided I need to cook with wine more often. This was delicious! I used zucchini noodles to healthify it and topped it with a bit of goat cheese. So good! Alisha, cooking more with wine is never a bad thing! 🙂 So glad you enjoyed; and what a neat way to cut the carbs! Thanks for your comments. I pinned this recipe over a year ago, but only got around to trying it tonight. It was a big hit with my husband. We both agreed it would go into our regular rotation. Thank you so much for sharing the recipe. It was amazing! Trisha, that’s wonderful! (Better late than never, right? 🙂 ) So glad you both enjoyed, and that this dish will now be a part of your regular meals! Thanks for sharing. Made this last night and it turned out fabulous!!! Restaurant quality for sure! Will definitely make again. Thank you! Hi Julia, thanks so much for the compliment—so glad you enjoyed! any ideas on how to turn this into a crockpot recipe? we are remodeling and do not have a working stove at the moment. Hi Erin! The truth is I’m not all that versed with crock pot cooking; I’m sure the sauce can be made and simmered on low to blend the flavors, but not quite sure about how the pasta part would work. Perhaps adding a bit more liquid like stock, or even some water or more canned tomatoes, and cooking the noodles in the sauce towards the end until tender? That may work. Good luck with your remodel! Is there a replacement for the wine in this recipe? Hi Lyndsey, you can just simply leave it out, and proceed to the next step! curled up on the couch with a BIG bowl of this….DEEEELICIOUS!!!!!!! Josie, that’s wonderful! So excited you enjoyed this recipe. Thanks for sharing with me! Just found this recipe as I had sausage patties and wanted to make something out of them, cooking it now it smells delicious! Saved it to my favorites, thanks for sharing! Brilliant recipe!! Lovely melding of flavors and colors A definite keeper! Amy, thrilled to read that! Thank you for sharing! I have made this recipe a few times now and every time it is a hit! Everyone in my family loves it. Only thing I add differently is an extra package of mild italian sausage along with the hot. Just so good any season of the year. Linda, I’m thrilled you’ve been enjoying this! Glad you’re “customizing” it to fit your tastes, and that you’ve got the whole family’s approval with this one! Thank you for your comments. I followed your recipe exactly as written, (other than I used crushed tomatoes) and I couldn’t have been happier with the results! Normally I always am tweaking a recipe, but found this had everything I loved. My picky boyfriend, who “doesn’t like” onions, peppers OR basil stole the entire container of leftovers this morning. Melissa, that is too funny! Well, looks like you converted him to onions, peppers, and basil! You just needed to “right” recipe, haha… 🙂 Thanks so much for sharing your comments—I’m so glad you both enjoyed! This was FANTASTIC! Definitely in the top ten meals I’ve ever made. Loved it. Krista, thrilled to read that!! Thanks for the comments. making this tonight, can’t wait!! It looks SOOO good!! I hope it works out alright cuz I couldn’t find the Pappadelle noodles so I bought Fettechini cuz it was the thickest I could find!!! This dish is a favorite of the kids and I. We make it all the time! I’m late but I just found this recipe. The only thing I changed was I added a little tomato paste because I wanted a darker color. Great recipe and really easy directions. My husband loved it! I had to make a slight substitution, though. I didn’t have enough white wine, so I used half white, half red wine and it was awesome. For any of your gluten-free readers out there, may I suggest serving this with Thai rice noodles – the kind that are used for Pad Thai, and resemble linguini noodles. They were perfect with this! Hi Jen, great suggestion for a gluten-free version—thanks for that! Glad you both enjoyed, and that you got creative with the recipe. Thanks so much for taking a moment to comment! I just made this for my family last evening and it was a huge hit. The only thing I changed was I used Cubanelle peppers for the bell. Very tasty! Keeping this one! Hi! Was wondering if I could use red wine instead of white? Hi Shelby, absolutely! Hope you enjoy! This dish is amazing and simple! I used egg noodles because I couldn’t find pappardelle pasta. My whole family loved it! This was SO good! Better than spaghetti in my opinion! We love Pad Kee Mow (Thai drunken noodle) so I knew this would be a sure thing! I am posting it on my blog tomorrow and I will credit you and provide a link to your blog! Thank you for sharing! Hi Zena! I love hearing that the kids help out with preparing dinner! So glad you all enjoyed the recipe—and the wide egg noodles are perfect. Thank you for your comments! This is one of my favorite recipes… it has been a huge hit everytime I have made it. I did add tiny yellow fresh tomatoes (cut in half) for added color, I promise you this recipe is magnifico…. So sweet of you! Thank you for your comments. I have made this dish twice and love it and going to make it again tonight with fresh pasta. Ooh-la-la, fresh pasta! That, indeed, will be very good, Silvia. So glad you’re enjoying the recipe! Thanks for sharing with me! Hi. This recipe looks and sounds amazing. Going to be making this for the family tonight, but was kinda curious, I dont have any white wine. I do have red cooking wine and liquor. Haha. Would it be ok to substitute it out with red wine or just omit it all together? I do have chicken broth also. What do u suggest? I made this for eight last night and it was delicious. I used pinot grigio and some leftover champagne and bucatini noodles. Thanks. It was easy as the sauce was prepared — all I had to do was to boil the pasta and toss when it was time for dinner. Linda, I’m thrilled this recipe was a success for you and your guests. Thanks for sharing with me! Just made this for dinner tonight, but i changed it up a bit, as i like to do that with recipes, tweak them to our family’s tastes. I used 1/2 a 900 gram bag of rotini instead of the pasta called for, and baked it in the oven for 35 min with mozza & cheddar blend, grated on top. It was delicious! Thanks for this awesome recipe! My family loved it! Hi Charlene, way to make it your own! Glad you guys enjoyed! I would like to make this but my husband doesn’t like any type of bell peppers. Will the recipe be just as good if i dont add the peppers? Hi Rebekah, it honestly won’t be the same. You get lots of that good flavor from those peppers. You could certainly still give the recipe a try without them, but just know that the flavor will be muted and different. Making this for dinner tomorrow night…to save time as guests are arriving I’m assuming it’s ok to make the sauce ahead of time and then just reheat it as I’m cooking the pasta? I’ve always heard that pasta sauce is better the next day. Thanks! Hi Joan, absolutely! Hope you and your guests enjoyed the recipe! Did we ever!! I have to say this is honestly one of the most delicious pasta dishes I have ever had. Completely restaurant worthy and I am looking forward to making it again. Thank you! Wow, what a compliment, Joan! Thanks for sharing that! I’m thrilled it turned out, and that you’ll be preparing this again. I pinned this long ago and forgot about it. Well, this morning in my quest to come up with something different for dinner, the recipe caught my eye once again, so I printed it off and to the grocery store I went. May I just say, “Fabulous”? My husband, who is a very picky eater, loved it. This recipe will now be part of my go-to recipes and I can’t wait to make it for friends, as well. Thank you so much! You know, Hildy, I always say better late than never, lol! 😉 So glad you both enjoyed this, and I’m thrilled that you’re looking forward to sharing this recipe with others, as well. Thanks so much for taking a moment to comment and let me know how things went! Oh my! How is it that I’m just now discovering your blog! Ingrid, I found my way here from a search for “spicy Italian sausage with noodles” and I can’t imagine a better match than this recipe! I made it last night and it was supremely yummy. Comfort food was definitely in order and this was comfort food, redefined. Drunken Noodles is one of my favorite Thai dishes; we’ll definitely be making this Italian version again!! Thank you so much! Hi Rachael, better late to find us than never, lol! 🙂 So thrilled to read that you enjoyed this recipe, and I hope you get the chance to peruse others and perhaps find some more goodies! Thank you for stopping by, and for sharing your comments. Bravo, just made this tonight and you rock. My husband and I can’t wait to have leftovers…probably for breakfast tomorrow morning. Thank you for awesomeness. Made this tonight for dinner…. Followed the recipe exactly and this was absolutely amazing!! One helping was not enough. The spices mixed with the flavors of the sausage were spot on. This will be added to our weekly rotation for sure! Thank you!!! Made this dish tonight and holy crow was it good! My boyfriend and I both agree this recipe will be a new staple in the house! I chopped the onion and peppers the night before, so throwing it together tonight took no time at all! Excited for leftovers for lunch tomorrow! Thank you! Katie, perfect way to do this, and save even more time on an already-quick recipe! Glad you both enjoyed this so much, and that it’ll go into your “staple” file. 🙂 Thanks so much for sharing your experience! Thank you so much for doing what you love. This recipe is huge hit with my family. We have a lovely garden that provides several goodies from spring till fall. We have many onions, peppers, tomatoes, and parsley. When the peppers are in my husband says “Yay, we can make drunk noodles!”. I have been caught without the Pappardelle noodles so I made lasagna noodles, cut them in half then cut the halves in thirds length ways…and it worked!! I also agree that things can get dull and boring in the kitchen so to combat this my husband and I alternate picking a new recipe every week. We have had many winners like yours and some losers. But it has been a wonderful experience. Thanks again for keeping the kitchen interesting and tasty! April, so are so, so kind…thank you for your encouraging and sweet words! We do what we do for folks like you. 🙂 What a thing to have a garden like you do with all sorts of delicious and seasonal items! Perfect for a dish like this; and by the way, how creative are you?! Using lasagna noodles cut in half in a pinch! Thumbs up! Thrilled that you guys are enjoying this recipe, and I encourage you to peruse more on our site, and enjoy those, too! Thanks for your comments! I just found Cozy Apron. Pined a lot of Pasta recipes. I have a stomach issue. No seeds, etc. Have you ever seen seedless canned tomatoes. I froze some this season and thought about trying the water bath canning. This is my first issue with problem. Seeding tomatoes is a project. I even thought of cooking, strain the seeds out which also takes out juice. Figured I could add some sauce to make up for it. Thought you may know if there are canned seedless since you cook so many pasta dishes. Thanks in advance . Everything sound delicious . OMGoodnes, this was delicious!!! Made it exactly by your recipe and we loved it! This one is definitely a keeper. Thank you so much for sharing! Hi Frani, thrilled you enjoyed this, and that it’ll be a recipe you come back to from time to time! Thank you for sharing your experience with me! Can the white wine be substituted with chicken or beef stock? Hi Melissa, it certainly can. 🙂 Hope you enjoy! I didn’t get through all the comments, so I’m not sure how many are as blown away as I am! I’m going to add the Italian sausage to my grocery list and can’t wait to try the recipe…but whats truly got me right now was your inspirational writing!!! My husband (of fifteen years) and I have had this nagging thing going where he doesn’t like anything I cook. ANYTHING!! I don’t know what to fix ’cause he doesn’t know what he wants! And it’s amazing how much it bothers me! I’m a stay-at-home wife and mother and really my one real daily task (no matter what else the day brings) is to bring them all to the table and watch them leave happy! What a wonderful reminder that it’s not necessary to keep trying all this new stuff that we don’t like…just re-invent what’s worked for the past decade and a half…like rearranging the living room with the same furniture or getting a hair cut! I’m so excited to go now and make out my shopping list (with the same stuff as always) knowing that I’ll be experimenting and actually enjoying my time in the kitchen next week! Thank you so much for motivating me and bringing the joy of cooking back! Billie, wow! Thank you so, so much for sharing that with me! You have inspired me with your enthusiasm, and with your willingness to make a shift in your viewpoint and to approach things in a new way. I’m beyond humbled by your words, and also encouraged that you gained some uplift from the writing in my post. Much appreciated, and I hope that you will, indeed, enjoy not only this “fresh perspective” , but your time in the kitchen now, more. Just remember: they only thing you really have to do is fill your cooking with specific intention; remember why you do it in the first place! Fill it with the love you feel towards your family, and they will certainly taste it. Happy cooking! Made this last night and it was amazing! Wonderful, Michele! Thank you for sharing your experience! I made this last night and really enjoyed it. I followed the recipe as is, but I wasn’t too picky about quantities: Italian sausage comes as either 5 links or in a tube, both are 16 ounces, I just used 16 ounces. the noodles came in a 12 ounce bag, I used the whole thing rather than 8 ounces. It probably would have been better with fewer noodles, but it was still flavorful and delicious. Rex, thank you for sharing your experience—I’m glad you enjoyed the recipe! I made this tonight for my non vegetable eating husband (and I can do w/o meat). We both loved it! Just ate around what we didn’t want… wonderful flavor, filling and light. Now I’m going to try your pumpkin rolls. Your newest fan! Hi Gina, so glad you both enjoyed and picked around what wasn’t your favorite parts, lol! Thrilled to have you as our newest fan; hope you continue to come back for more recipes, and to enjoy what you discover! i made this for my family a few nights ago and they loved it! my husband took it to work for lunch today and said it really re-heated well. I did add a titch of balsamic vinegar because, well, we LOVE balsamic vinegar in our Italian dishes (just a teaspoon or so to add a little acidy sweetness). i didnt have any pappardelle and didn’t have time to make some so i used farfalle (bow ties) and they worked quite well. This will definitely be added to our dinner rotation. Thank you! My hubby and I love to cook together. This is one of our new favorites!!!! We used an Itailian Red Dry wine instead of a white wine and turned out fantastic! Thank you. Hi there, I love reading about couples that cook together! Beautiful! So glad you both enjoyed the recipe, and I thank you for taking a moment to share the experience! This is my NEW go to sauce! It is amazing!!! Thanks so much for sharing! Love it!!!! Sherry, the pleasure is mine! Hope you enjoy! I have to tell you, this has become a staple in our home! We love, love, love this dish! Wow this looks great. Do you think it would be possible to make the sauce the day before? Hi Ellie, certainly! It would be even richer & deeper with an extra day under its belt. Hope you enjoy! When asked what is my favorite meal, my answer has become this dish! Thank you so much for sharing it. Jess, I am so very touched by that! Ah… so sweet. Glad you enjoy the recipe so much, and I thank you for sharing your kindness with me! Gonna so try this tomorrow for dinner…really love how everything is in one pan…I’m going to add some zucchini to it…thanks for sharing!???? My pleasure, Cathy! Hope you enjoy this! This was off-the-charts amazing—this is as good as your finest restaurant quality dish. At the end I did crumble some goat cheese across the top! 👍👍👌 I can’t wait to look into your other recipes. Hi Joyce, that’s so wonderful! I love the goat cheese touch! And yes; I hope you take a little perusal through the other recipes—I’m sure you’ll find more goodies! Thank you for commenting. I made this for my boyfriend and his “picky” teenagers. Everyone LOVED it!! I have been making it regularly ever since! Thank you for the delicious recipe! Lisa, how awesome!! So glad it’s become a part of your rotation, and that everyone, including “picky” teens, can enjoy it, lol! Thanks so much for sharing your experience with me. So I’m happy to have stumbled upon this recipe. I would say that I used it as a suggestion for structuring my own recipe. My changes were to add in fresh celery, dehydrated mushroom and carrots. I take after my grandmother and add carrot and celery to tomato-based sauces. I also used beef broth and balsamic vinegar to deglaze the pan and pick up all the goodies that stick to the bottom of the pan. Can’t wait to serve this to my husband, he will love it. Thanks for the recipe! Sarah, glad you made this your own! Thanks for sharing! Hi Patti, glad to read that! Thanks! I have made this recipe more than a dozen times! It’s one of my husband’s favorites!! All I have to say is “honey, we’re having drunken noodles tonight” and it puts a smile on his face! Thank you for this wonderful dish! This looks so great—but one catch!! I’m allergic to tomatoes. I was wondering what I can substitute or how to go about leaving them out. Should I just add a bit more liquid & call it good?? Not sure here. Unfortunately it’s a normal occurrence when I find amazing sounds & looking recipes of figuring how to go about editing out the tomato. Thanks for the help!! Hi Kinsy, that’s s big “catch”, lol 😉! You know, I think you can still enjoy this recipe, even without the tomatoes. So I would just leave them out, and leave everything else in, and like you said, add more liquid since you’ll need it. Now, I’m just “guess-timating”, but try adding maybe 2 cups chicken stock to make this juicy- maybe a bit of extra wine, even. It’ll be more of a sausage & pepper pasta dish. Hope you enjoy it, and please let me know how things go! Tomatoes add acid, a necessary ingredient for any dish to be “tasty”. Try adding something acidic to replace the tomatoes, such as a few tsp/TBL of your favorite vinegar or lemon/lime juice. Also, since the dish is using pork sausage, sometimes some cut up apples that are tart are nice, too. Curious if I could substitute red wine (a malbec) for white? We are a red wine household and I never have white on hand! Would this change the flavor profile a ton? For better or for worse? Thanks! Hi Cory, use the red! Totally fine. It’ll be de-lish! Is it supposed to be a bit watery? Hi Marly, no, it’s not supposed to be watery. Hi! Made this a while back and my husband was swooning over how delicious it was. A friend saw the picture has been begging me to make it for him and his wife. So excited to share it with them this weekend over homemade pasta noodles. Thank you for this recipe. It has become a family favorite! Love this recipe! Have made it at least twice a month. Delicious. Thanks! Kathy, that’s great! I’m honored to have this recipe in your rotation; thanks for letting me know! Made this tonight for my family. Even my picky eater husband raved about it! Love it!! Annissia, I love that, too! I’m so very happy that everyone enjoyed ☺️. Thank you for commenting. I made this recipe tonight for the first time and it was ABSOLUTELY AMAZING!!!! Everyone loved it so much that I need to make another before the end of the weekend so that everyone has some to take to work/school for lunches 🙂 It’s extremely rare that I find something everyone in the house likes. THANK YOU!!! Cynthia, I love that!! ❤️ I know it can be challenging to prepare meals that everyone in the household enjoys, so that is a big deal. Thanks so much for sharing that with me, and I hope everyone gets as much pleasure from it the second time! Made this last night and my husband and I loved it! It tastes even better today for lunch! My daughter is at a stage of not eating anything that I make (10 years old) but…. she was sneaking peppers out of bowl and eating them. We used extra wide eggs noodles and they worked great. Hi Margie, that is so, so awesome! I’m so happy you guys enjoyed this so much—and isn’t it something how those leftovers often taste even better? You made me smile when you mentioned that your daughter was picking out the peppers from the bowl and eating them, lol…that’s a 10 year old for you, one that doesn’t want her mom to know that maybe, just maybe, she actually kinda liked what her mom cooked! Thanks so much for your comments. I made this last night! Thank you it was Fabulous! Yummy! I got the noodles from Walmart in the frozen section. Hey Kim, so glad you enjoyed! And thanks for sharing with folks where you found your noodles—always helpful! Excellent recipe! Made according to directions except I substituted chicken broth for the wine. My husband hasn’t stopped raving about it :-). Will definitely make again!! Hi Lori, thanks for sharing that with me! I love it! Glad this one’s a keeper. The drunken noodles have become my favorite pasta recipe. Thanks! Hey Katherine, so thrilled to read that—that’s a nice, big compliment! Glad you’re enjoying this recipe so much, and I’d like to thank you for taking a moment to come back and share your experience with me. May you continue to gain pleasure and comfort from this tasty dish! My boyfriend told me to find something I want to request for him to make for dinner tonight and I came across this pasta. I’m buying the ingredients so he can make this for us, it looks so freaking good!! Gena, I am so excited to read that—good choice of recipe, haha! I truly hope you both enjoy this tasty pasta dish, even enjoy preparing it. I think it’s great that you have a boyfriend that is willing to cook for you both—really special and lovely. Hope you have a wonderful experience! My pasta only comes in 16oz. Do you think I should half it or would it be ok to add extra pasta to the dish? Hi Jen, pasta typically comes in 1 pound packages, so yes, just use about half. Hope you enjoy the recipe! Have you ever tried freezing this with the noodles? I love this recipe and want to make it for my daughters maternity leave. I’m sure the sauce would be fine just curious if anyones tried freezing it with the noodles. Hi Tracy, my concern is that the noodles would get a little mealy; but perhaps if they were kept separate, in a ziplock bag, that would be better. And by the way, best wishes and congratulations on the upcoming arrival of your grandchild! Thank you for the quick reply. I was thinking the same thing. I wad hoping someone tried it.i did make the sauce though and as always soooooooooo yummy! !# thank you for the well wishes too, it’s exciting!!! This was absolutely FANTASTIC! It is so hearty and flavorful. I am glad Fall is here now and our Southern California weather is cooling down a bit so so I can make it over and over again. One of my husband’s favorite pasta dishes! Thank you for sharing! Lisa, so happy to read that! And yes, let’s hope that our So Cal weather is finally on the cooling trend (I’m not a hot weather person! ), so that we can enjoy more cozy recipes like this. Thanks for sharing, and happy cooking! I make this quite a lot. I switch out the the noodles with zucchini. I also change up the meat depending on much mood. If I use chicken or turkey sausage, I add extra seasoning. One of the best recipes! Hi Brenda, way to make this recipe your own! Glad you’ve been enjoying it so much! I made this tonight. I used two sweet and two spicy sausages. I couldn’t find the pasta noodles either, so I used fettuccine. We liked this dish a lot! It was so flavorful!! Thank you for sharing! I’ll be making this again! Like my Dad used to say “It’s better then good, it’s delicious”! I love your dad’s saying, Nancy! How precious! Thanks so much for letting me know that you all enjoyed the recipe, and for sharing your substitutions. It’s such a comforting pasta dish, especially now with the cooler weather! Happy cooking. I made this last night and it was fantastic. Great recipe, husband loved it! Melissa, thanks so much for sharing that with me! Always love it when the hubby’s belly is happy, too. We loved this recipe. I thought the 3 peppers were going to be too much but oh no…perfect. I made recipe just like it says except I used med. egg noodles and it is delicious. Only thing I am going to do next time is add more sausage (5). Will be making this quite often. Hi Karen, so glad you enjoyed! Thanks so much for sharing your experience. I’m making this tonight how much Italian sausage by weight? I just made this tonight. It was absolutely delicious. Hi Claudia, so happy you enjoyed!